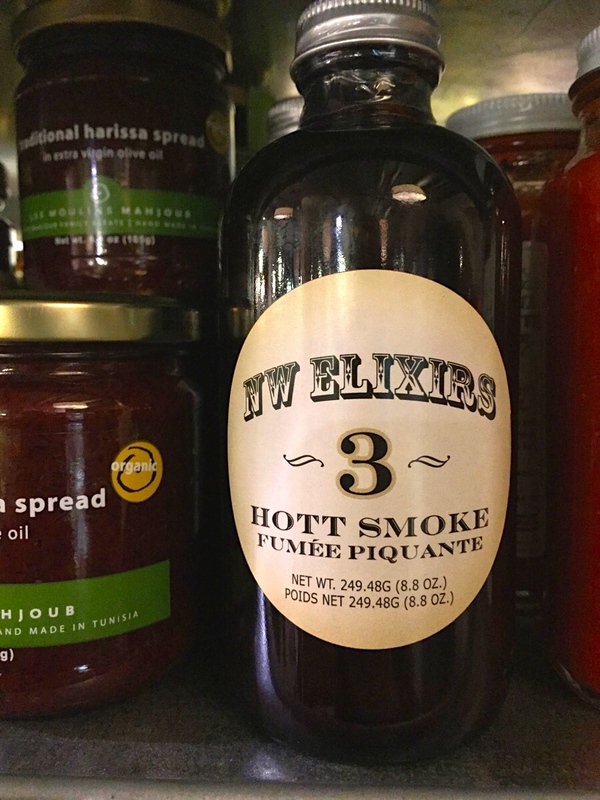 Just a few tidbits you might want to consider for last-minute, local, food-and-bev- oriented gifts. Or, you know, start your shopping NOW. I’m saying this kind of gloatingly from my high horse of Canning Nirvana Christmas Presents. Actually, I’m sitting on a mountain of frozen food and gloating. Ouch. It’s chilly up here. For those reasons, I’m always late on the food blogger giving buyable Christmas present lists. Sorry. That doesn’t mean these things aren’t worthwhile. 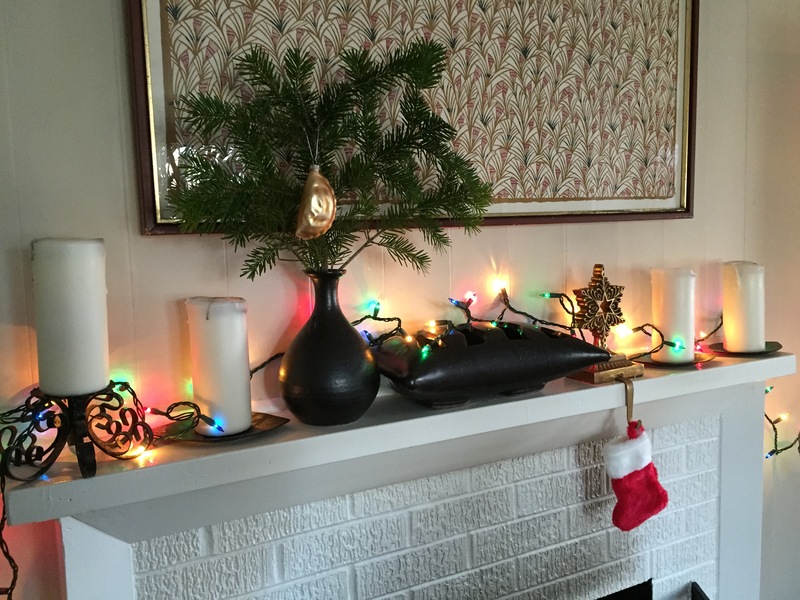 1) A blown glass golden pierogi ornament, as pictured above on my mantel. Forget those German pickle ornaments as so last year. There are also golden ravioli, if you are so unfortunate as to not be Polish. 2) A couple of bottles of O Wines chardonnay, which is an initiative to raise scholarship funds for young women, owned and managed by St. Michelle Wine Estates. Read more here about the story and wine. I received a sample of the red table wine and the chard, and both are pleasant and food-friendly and budget-happy, perfect for a gift for any family holiday party. Also, the logo looks like our ‘O’ for University of Oregon, so sportsfans would dig it. Their website notes that many of our local groceries (Albertsons and Safeways, Fred Meyers, and the Market of Choice on Green Acres) all carry the chard; not sure about the Red Blend. 3) Silicone goodness at Hartwick’s, if you can’t afford that sous vide machine or the Vitamix you’ve your loved one has been craving. 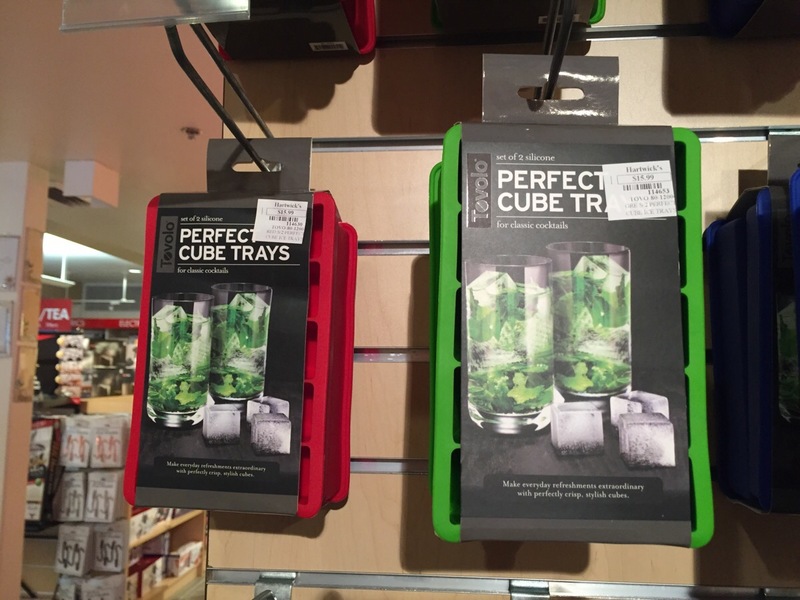 These perfectly square ice cubes are oddly satisfying; the trays are often used by high-end bars. 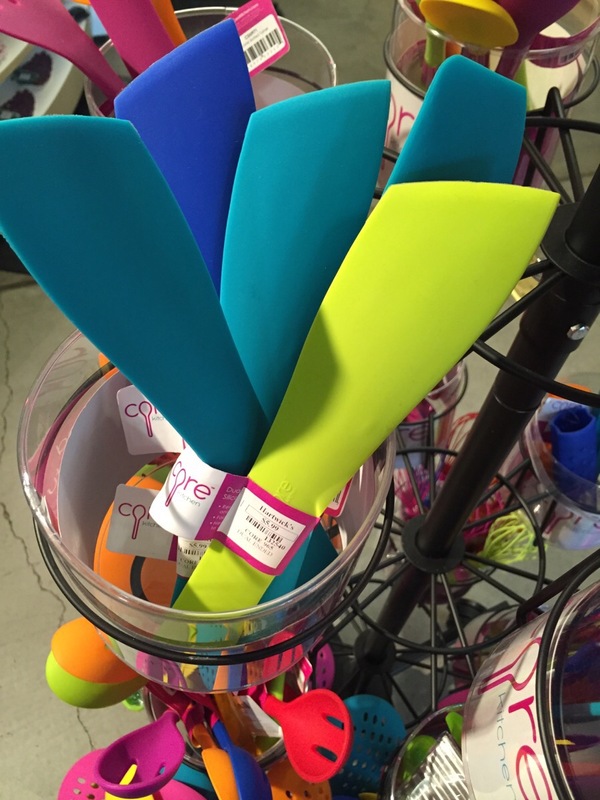 I’m not sure who else uses the silicone spatulas but me, but I wholly endorse them as one of my favorite kitchen items. 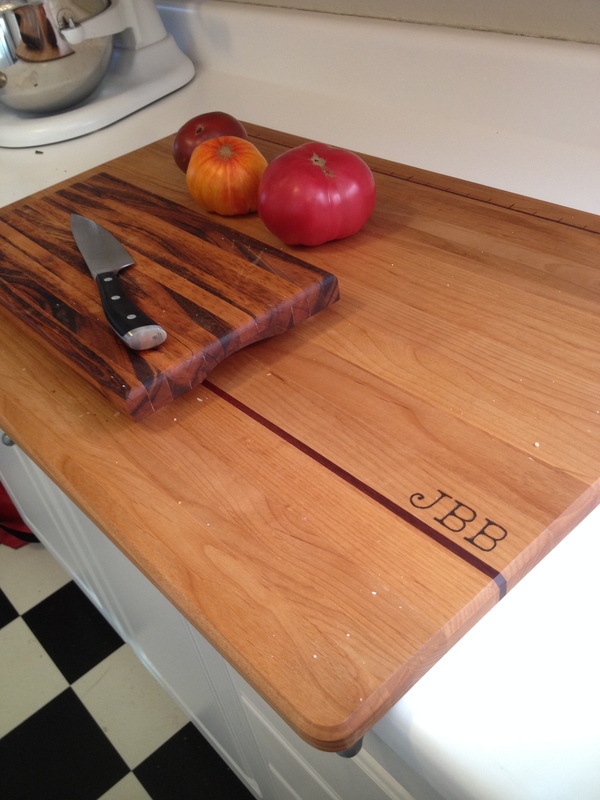 You can use the business end or the handle for stirring and scraping various-sized projects, and high heat is ok.
4) A gorgeous wood pasta board or cutting board, custom-made by Bill Anderson in Eugene. Chef Rosa Mariotti‘s partner, Bill Anderson, is a retired engineer and woodworker, and he’s been making these lovely pasta/pastry boards and smaller cutting boards from various hardwoods, some exotic like the striped tigerwood. I have an entire album of samples here. They’ve kindly offered to sell the boards as a fundraiser for the Master Food Preservers of Lane County, OR. The pasta boards go for $90 and up (with the tigerwood being on the higher end), and Rosa can fill you in on the price of the smaller boards. I bought one of each, and they’re spectacular. For inquiries, send a message to Rosa on Facebook! 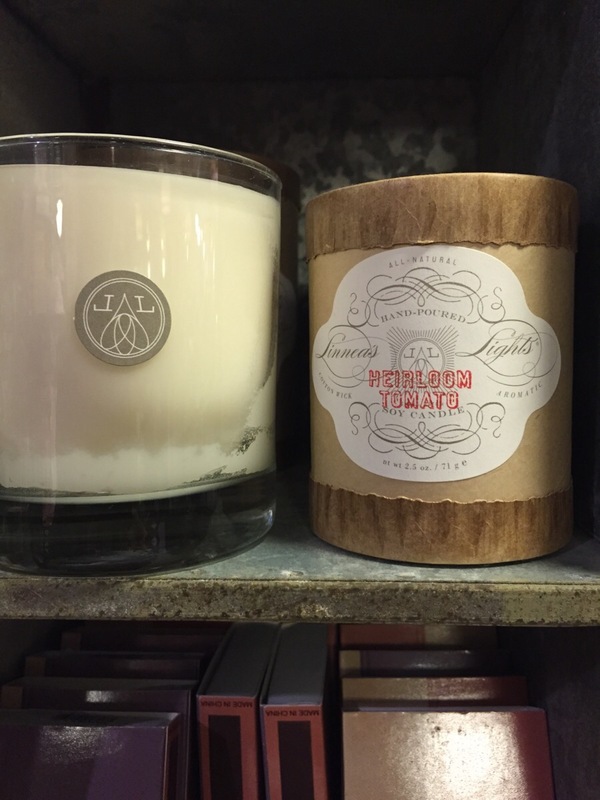 5) Tomato-scented candles at Marché Provisions, because it’s almost summer again, right? I like the scent of the tomato leaf one better than the prettier tomato one, but it’s up to you to choose looks over talent. 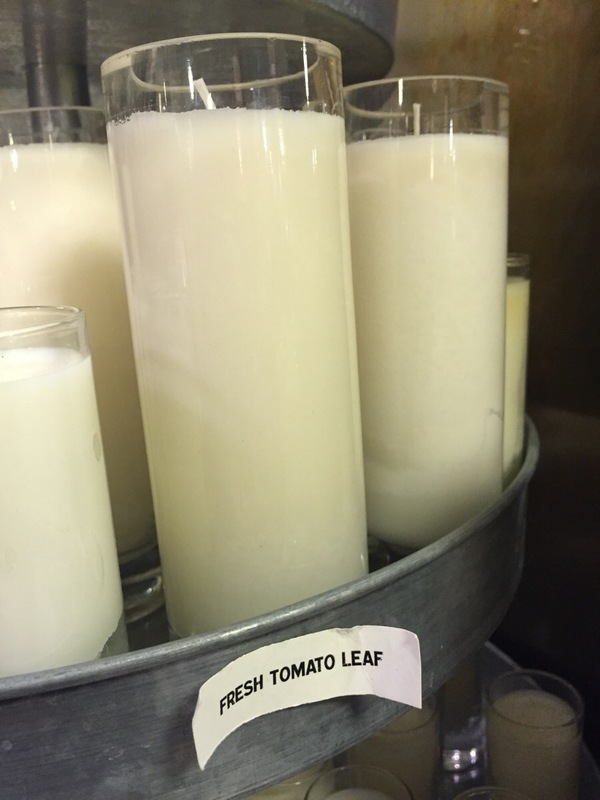 Or just buy any beeswax candle ever. They’re so sweet and slightly honey-sticky and that butterscotch color. Yum. 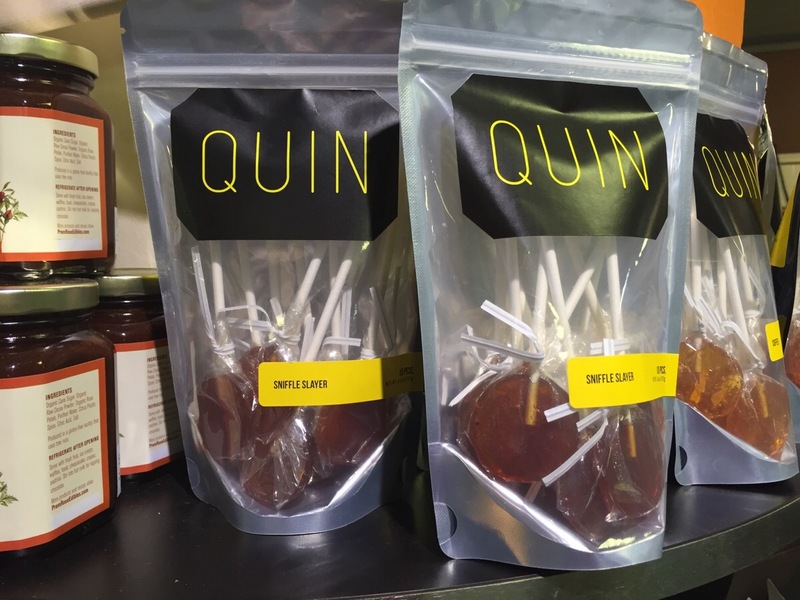 6) Also at Provisions, some truffles with local spirits (Bendistillery, Clear Creek, House Spirits, among others); a “Sniffle Slayer” lolly with lemon, ginger, honey and cayenne; and Hott Smoke sauce, which would kick those truffles’ and lollies’ asses. 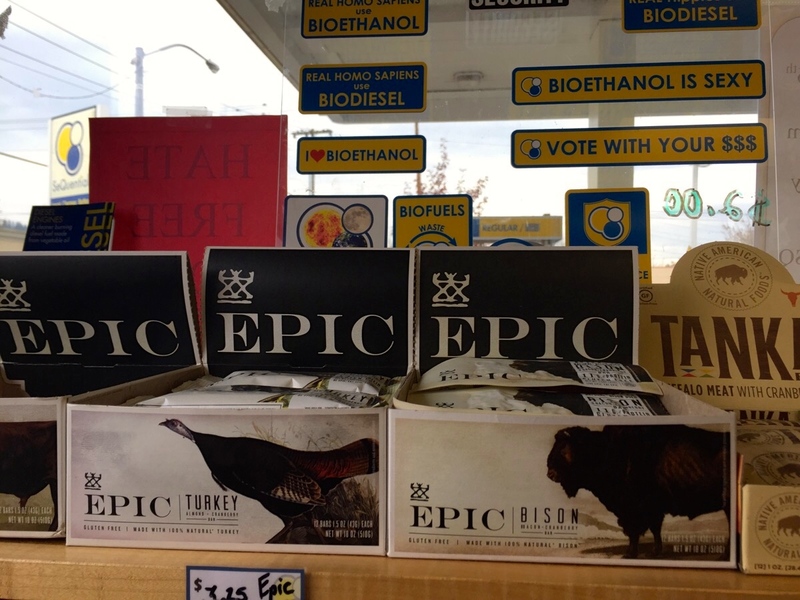 7) Any number of fascinating little kibbles and bits at Sequential Biofuel, our loving local gas station with all kinds of healthy, sustainable, and gluten-free-friendly stuff, like a bison “candy” bar. 8) An independent food magazine. So important now that media publishing has gone to hell. Molly Stevens’ All About Braising, an essential addition to your collection, even though you think you know all about braising. I just got it and I love it. Pair with her book on Roasting. Tartine No. 3, the famed bakery’s new all grain baking book. Probably not for the beginner, but you could try. The recipes are thrilling for anyone who is struggling to perfect the no-knead technique. Jeffrey Morgenthaler‘s The Bar Book, also via Chronicle Books. It’s pretty fab, unsurprisingly, as one of the only cocktail books out there to offer a solid, technique-based guide for the home bartender. Expect to understand principles and classics, not fancy trends. Boat, a Whale & a Walrus by Seattle chef Renee Erickson, whose restaurants — modern, chic, vibrant, shellfishy — embody perhaps the epitome of PNW cuisine. 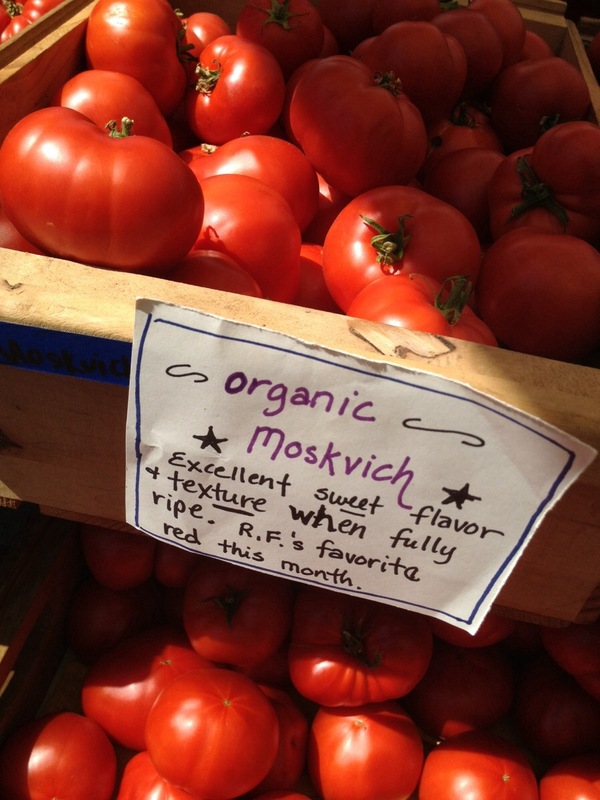 Not a cookbook, quite, but Heather Arndt Anderson’s new book about the food history of our fair City of Roses to the north, Portland: A Food Biography, promises to be filled with fun facts and even some recipes. Her Tumblr page is fascinating and reflects her research acumen, but be sure to click through to buy the book directly from her or the publisher. And two hyper-local farm-to-table cookbooks: Anthony Boutard’s Beautiful Corn, the best treatment I’ve seen on the science and culinary merit of corn from a mellifluous farmer/writer in the tradition of Wendell Berry, and a great collection of local recipes for Beans, Grains, Nuts and Seeds: Further Adventures in Eating Close to Home by my fellow Eugene locavore, Elin England. 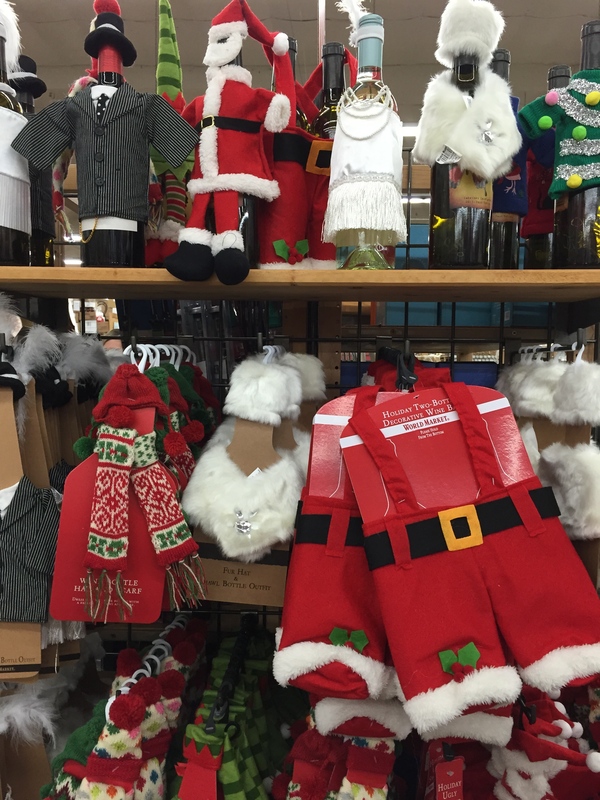 10) Aaaaand, for the ridiculous person on your list, one of the silliest things I’ve seen this year: costumes for your wine bottles. Available alongside many more reasonable gifts at Cost Plus. Or consider the leather cooler I saw on a clickbait site for gifts for the adventurous eater, or that damned “aroma fork” thing that makes your fork smell. WHY. Why not? My efforts to cook down the freezer continue, and soupily. I am off to pick up the beef today, and am proud to announce I managed to clear about half the space, so I should be fine. A major part of the square footage was taken up by what I thought was a half of a pig’s head (nope, a whole; surprise!) from my butchery class with Camas Davis. I also found a jowl and a cheek, as one does. Because the head was so big, I roasted it and stripped it for tacos (cabeza), then added the leftover bits to pork stock for a wonderful green chile posole with the other parts I had uncovered in my latest archaeological dig. Posole! If you haven’t tried it, it’s wonderful. I used up a bag of homemade posole (nixtamalized) corn, made last year, the last of my peppers from the two potted plants I had maintained until the frost, the last of the green tomatoes, some roasted anchos I found in the freezer, a big handful of oregano and tarragon still hanging on in the garden, and that wonderfully rich, gelatinous cabeza meat and some pork shoulder. 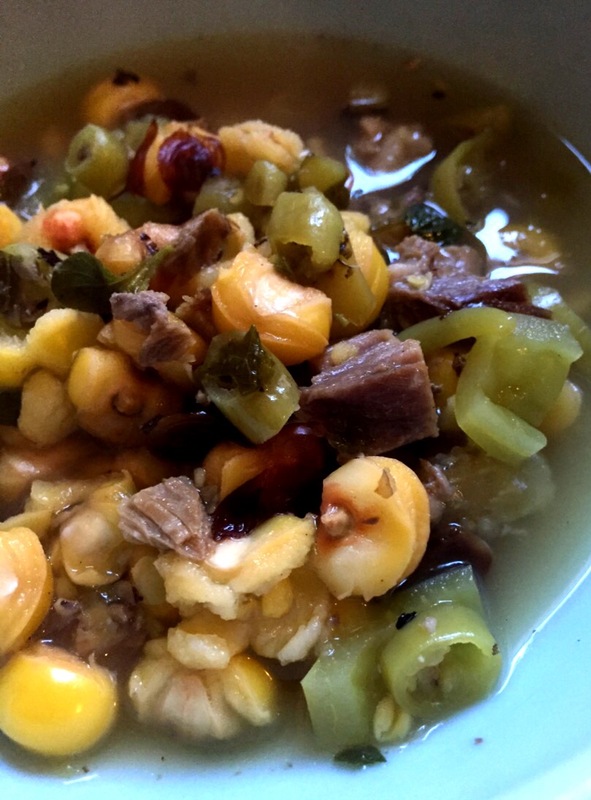 The cabeza really added so much to the broth, and I recommend it if you should have a head in your freezer. No questions asked. If you’re making it, here are a few more tips: I threw in a handful of local cornmeal to slightly thicken the broth, and simmered everything for 30 minutes or so, adding a lemon and some powdered ancho pepper and garlic powder near the end of cooking. Perfect winter meal, all local, but with a taste of warm sunny skies. 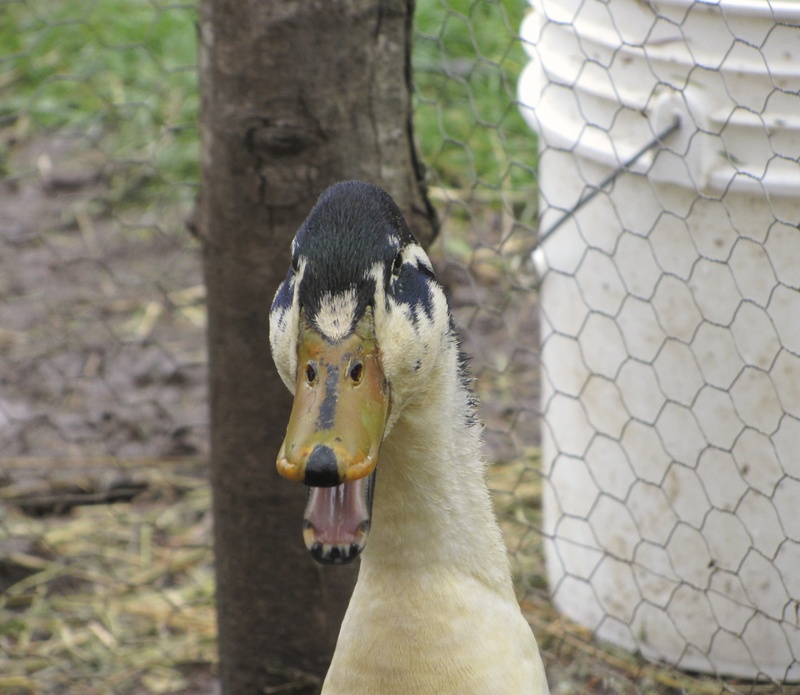 Of the fowl I coddled recently on a two-week farm stay, I became a duck supporter. Go Ducks! I had heard that ducks have a presence that chickens lack, and it’s true. Their soft, smooth heads and facial expressions just charmed the pants off me. And they don’t have roosters who insist on pecking me and they’re not geese, period. Seriously, a plus. I was helping out some family farmers who needed livestock coverage in nearby Cottage Grove, a bucolic little rural town of covered bridges, plant nurseries, bookshops, and great breakfasts. Part of my daily job was to process dozens of eggs from 24 chickens, a single egg a day from the horrible four-goose thug team, and whatever eggs the six ducks saw fit to lay. I also had to milk two goats, an endeavor I enjoyed quite a bit, and one I’ll write about later. So I suddenly found myself in the middle of the road of my life, surrounded by eggs. I’ve been experimenting quite a bit. I was reminded how delicious a classic béarnaise sauce is with a ribeye steak. I learned that, despite a promising concept and the heart willing, leftover béarnaise sauce does not a good scrambled egg make. I’ve made a glorious caramel duck egg bread pudding, a single goose egg chilaquiles (above), frittata, aioli, and Alice B. Toklas’ tricolor omelette with spinach and saffron layers, draped with tomato sauce. And, my friends, I made this. Duck egg leche flan with blood orange. Doesn’t look like much, does it? But o o o o that simple appearance belies a rich, deep, exquisite flavor of almost savory sweet egg custard, and the whole thing is bathed in caramel. It’s a Filipino specialty, and traditionally relies on creamy water buffalo milk and a sour lime called a dayap (similar to a calamansi), but now uses pantry ingredients. I opted for the “traditional” version with evaporated milk and condensed milk, managing to source some organic varieties of both. For some thoughts on the rich variety of recipes using different kinds of dairy and eggs or whole eggs, click here. I may still try it with cream and honey, but I present you with my first go, which was absolutely delicious. 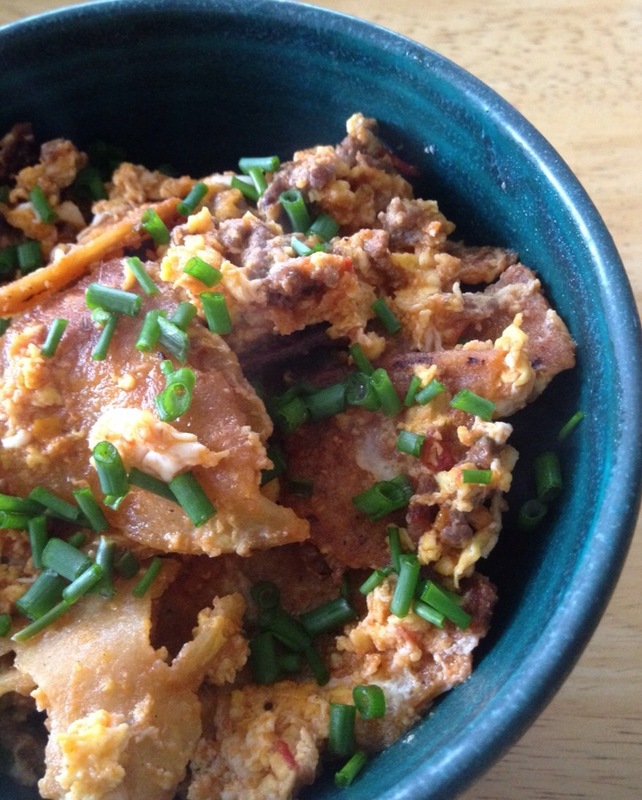 The recipe uses 12 duck egg yolks. If you ever find yourself in duck egg heaven, you won’t regret making it, since duck eggs are noticeably richer than their chicken cousins, but farm-fresh chicken egg yolks would work too. It just wouldn’t be as rich. And I hate to be a snob, but I wouldn’t bother making this with grocery store eggs and their pale yellow, tasteless yolks. The traditional mold, a llanera, can be replaced by a cake or pie dish or ramekin. A ramekin will give you less caramel on top, so screw that. 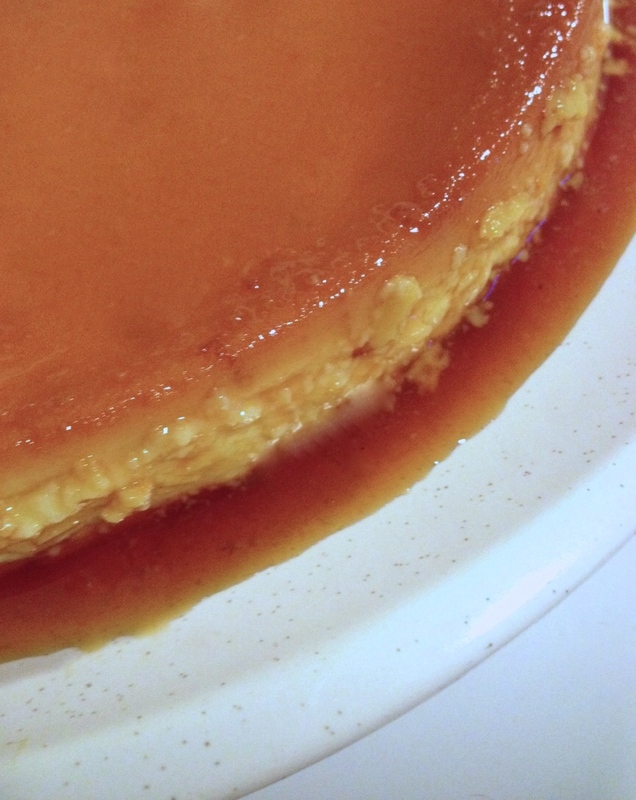 I found it much more reliable to bake the flan in a water bath versus steaming it (also more traditional). What to do with the duck egg whites? Well, they’re thicker and richer than chicken eggs, so they don’t work the same way in cakes and pastries. I suggest beating them to soft peaks and making chiles rellenos out of them, which is what we had for dinner the night of the flan. Yes, it’s decadent, but hey, I’ve got farm work to do. 1 can condensed milk (best quality), 14 oz. 1 can evaporated milk (best quality), 12 oz. Prepare a waterbath for a 10-inch cake pan or deep pie dish using a roasting pan or similar that will allow you to fit the dish in the pan and add hot water. Place your cake pan next to the stove. In a light-colored skillet, melt and caramelize the sugar on low heat. As it melts, gently push the unmelted sugar into the melted sugar to help keep the heating constant. Watch the skillet constantly, especially near the end, as burning is quick and fatal. You want a medium-dark brown color, but dark brown will impart a bitter flavor, so take it off the heat immediately when done, and pour it into your reserved cake pan, tilting the pan for a thin layer and ensuring that the caramel goes on the sides as well as the bottom. Place the pan in the roasting pan, and add very hot water to about midway up the side of the cake pan. Zest the orange and squeeze about a tablespoon of juice. Add to egg yolks in a medium bowl, and whisk. Reserve whites for another use. Whisk in condensed and evaporated milk, then pour batter into caramelized cake pan. Place pan into water bath prepared earlier, and cook until just set, about 1 hour. A knife inserted in the middle should come out almost completely clean (the caramel will make the tip wet). Don’t overcook. Let cool to room temperature, then refrigerate for several hours. Carefully slide a thin spatula around the sides of the pan, then invert onto a dish quickly. Be sure the dish is large enough for the liquid caramel on the bottom. Serve with whipped unsweetened cream, berries, or supremed blood oranges, grapefruit, and limes tossed with a little Grand Marnier. 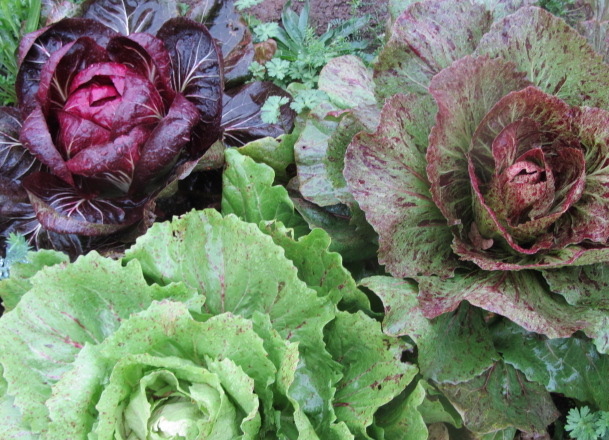 I’ve spent the winter getting to know one of winter’s sexiest families — the chicory. Anyone who has inadvertently grown a crop of dandelions in the Willamette Valley knows how massive and fertile these relations can be. If I’m not careful, I will find weeds locally foraged greens the size of dinner plates in my garden. I’m not really a fan of wild dandelions, but I do like their evolutionary determination, and the underlying bitterness common to all plants in the chicory family. 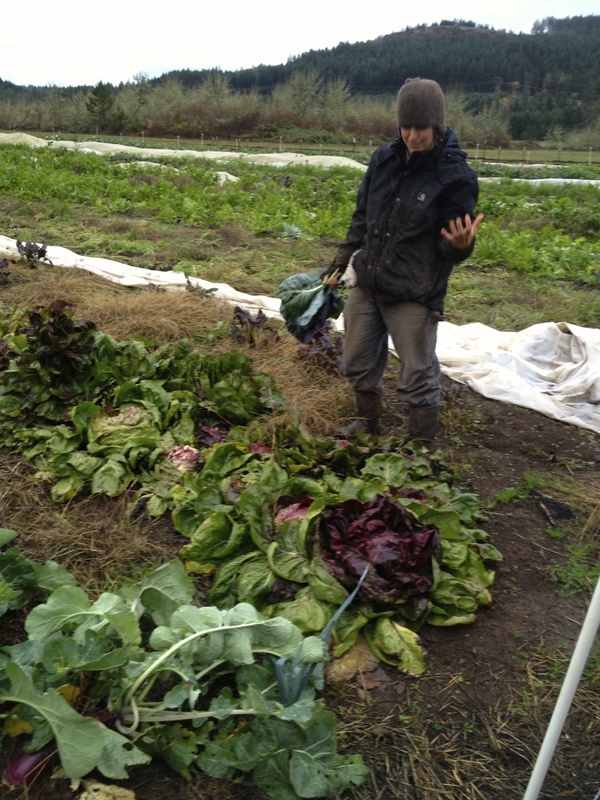 Endives, curly escarole, red radicchio (both the round chioggia and pointy treviso types), frisée, and the huge heads of sugarloaf (puntarelle, see top photo and the loaf Marco is holding, below) are becoming more and more popular as a winter substitute for romaine lettuce. Farmer Marco Franciosa of Sunset Lane Farm in Brownsville, a gentle man and gentleman I had the pleasure of meeting this winter thanks to fellow preserver Linda Ziedrich’s blog post mentioning his work, cultivates many kinds of chicories for the restaurant and specialty market trade in Portland with his wife, Kay. We went out into the fields on two grey, rainy days a month or so ago, and he showed me the easy way to grow chicory, above, and the hard way, which I’ll explain in a second. Marco uses seed from European sources and closer to home: his neighbor, Adaptive Seeds/Open Oak Farm (above, Farmer Sarah Kleeger marvels at the size of her heads). 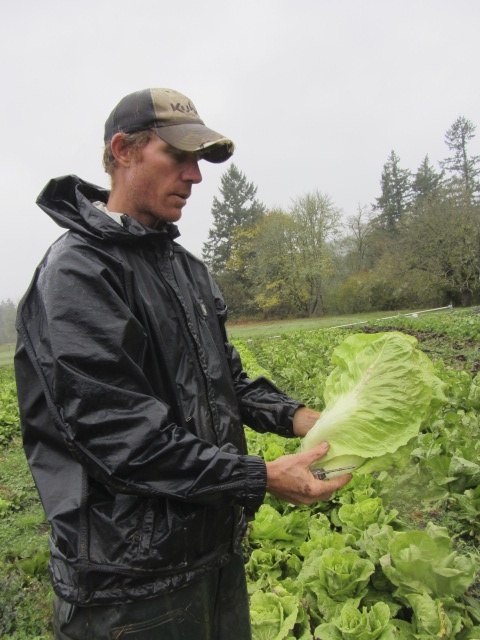 For the past three years or so, he has been experimenting with open-pollinated varieties and gorgeous crossed varieties that have yielded some stunningly pretty leafy greens. 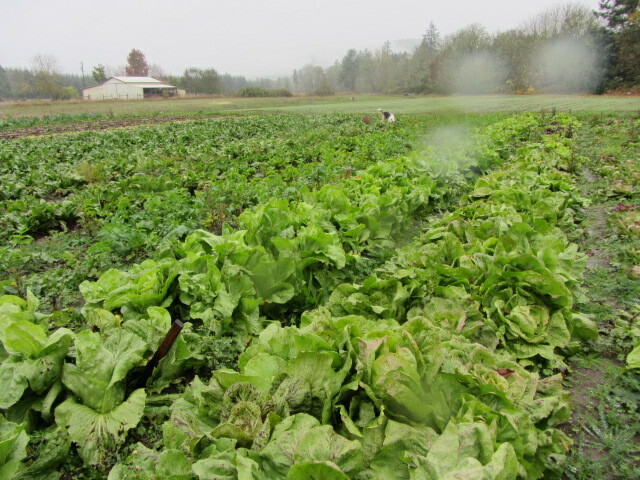 When I saw the chicory crops growing, I was immediately smitten. I’ve enjoyed Belgian endive for years; it was one of my first salad delights in my early twenties, served by a budding chef on a picnic on the bleak cliffs of Point Reyes, California, with pear and blue cheese and walnuts. I had never had anything that juicy and delicious that could be termed “lettuce.” There’s a recipe for a variation of this simple salad featured on Sunset Lane Farm’s website (I’d swap out the pecans for hazelnuts, personally, being the Willamette Valley nut I am). 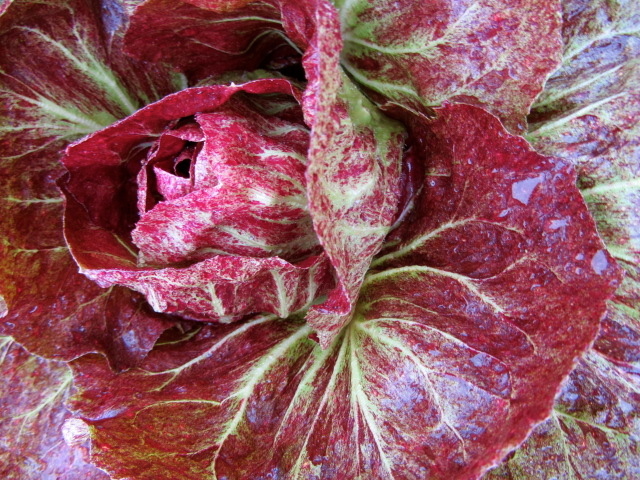 And local restaurants, most notably Belly, have been grilling escarole and using pretty speckled chicories raw in winter salads for years. Right now, for example, Belly has a chicory and duck confit salad with pomegranate seeds — one of the best things on the menu with a perfect balance of sweet, sour, salty, bitter, and meaty. Go check it out asap. But I hadn’t ever had much respect for the most common chicory we use in winter, curly escarole, which so often serves as a green base for something actually edible on a catering plate. The Dutch, as previously covered in my post on the traditional escarole mashed potatoes, like to use the big green leafy heads that they call Andijvie to add color and flavor to a winter staple. 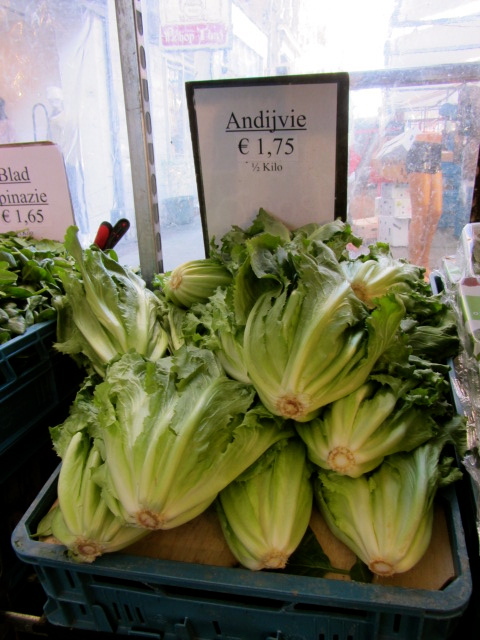 But they have a much greater variety of recipes for Witlof, the tight yellowy-white bullet-shaped chicory pictured above that we call the Belgian endive. (There is some debate about its origin in the area that now defines the Netherlands or that of Belgium.) It’s a vegetable beloved by children and adults alike, and a surprising number of recipes that range from the typical Dutch ham and cheese endive au gratin casserole to some strange and wonderful combinations. 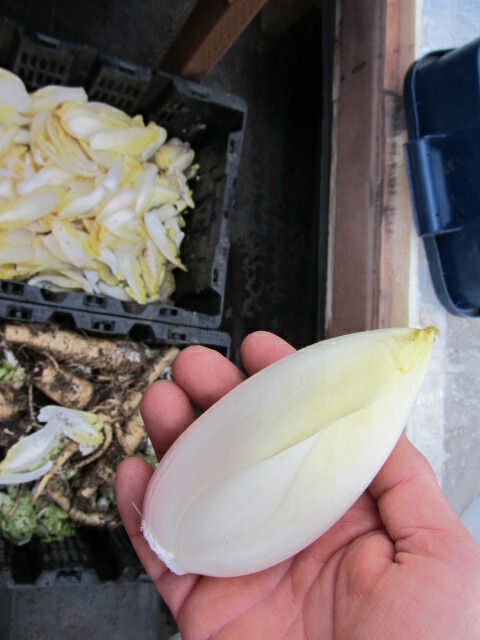 I’m seeking a publisher for a longer article on Belgian endive — both to showcase Marco’s wonderful specialty farm, which is to my knowledge one of two domestic producers of the crop, and the only one that uses the traditional method versus mechanized hydroponics — and to spread the word about this wonderful winter vegetable. 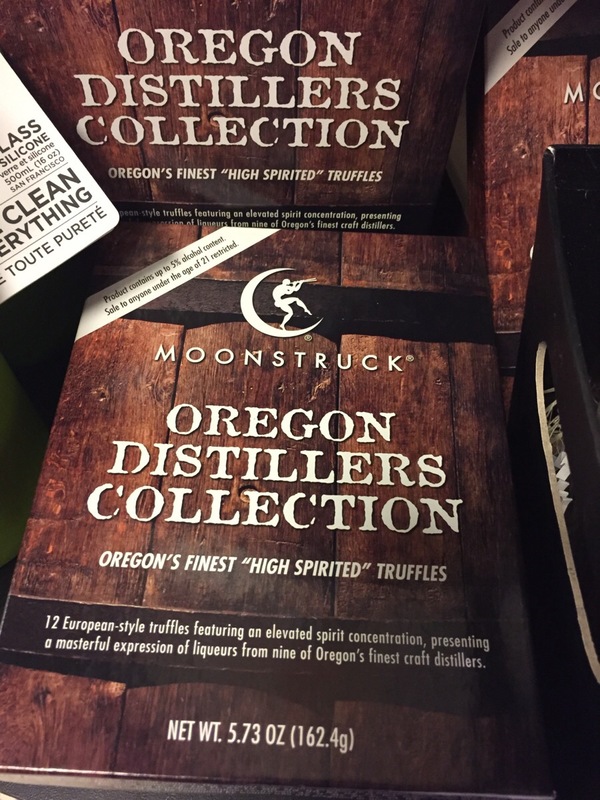 For some reason I can’t fathom, local magazines don’t seem to be interested in this story of Oregon tenacity and unique deliciousness, so I’m forging eastward (and learning how to write better pitches). Anyone interested? :) Here’s a snippet of what you’re missing. Belgian endive is, quite simply, a complete pain to grow. 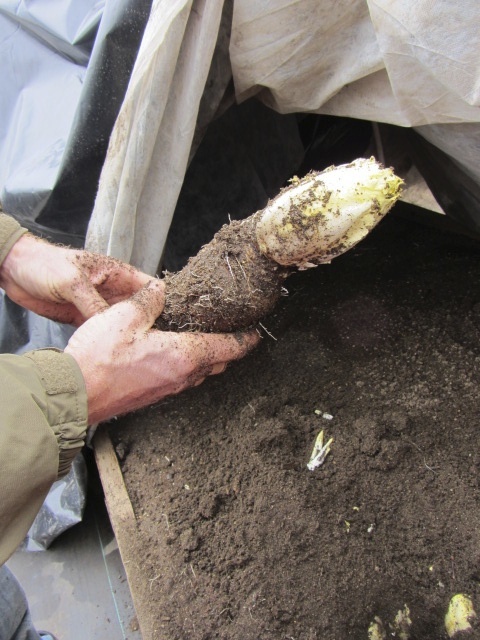 Unlike the other chicories discussed above, it needs to be grown twice — first, out in the rainy winter field as its brethren above, then chopped down, leaves cut off at the bud head, roots chilled, then replanted and forced in the dark to produce that little white silky endive. Then you can use the big roots for drying and grinding into chicory coffee. Another post on that to come. It’s a labor intensive endeavor, one made easier in Europe and in the sole (?) California producer here in the U.S. These large farms rely on big hydroponic operations that force the heads in dark rooms in liquid fertilizer solution so you don’t have to actually bury the things in sand and add variables plus cleaning off the sand. 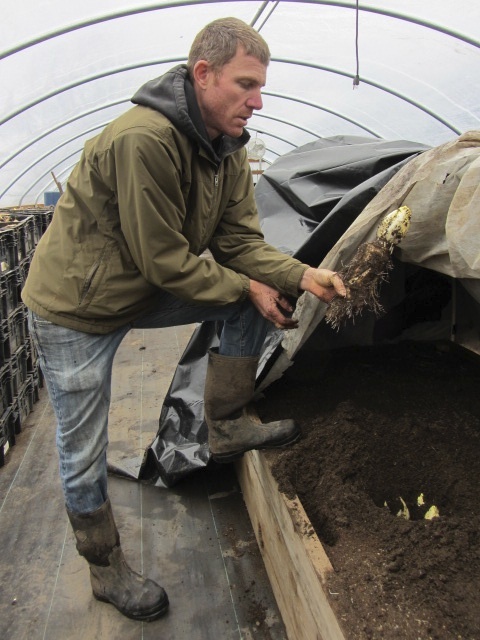 But Marco does it the old way by packing the roots tightly in heated raised beds. He compellingly argues that it’s worth it — the sand method provides a more complex taste and a fuller head. And oh, how right he is. Compare, for example, the prosciutto-wrapped heads below with Marco’s, above. See how there’s separation and greening at the top? I bought the green ones at Market of Choice. But even if you can only get the hydroponic endives, they’re still quite tasty. They store for a long time in a paper bag in the refrigerator. If you don’t keep them properly, they will start to darken and grow more bitter, much like the rest of us. 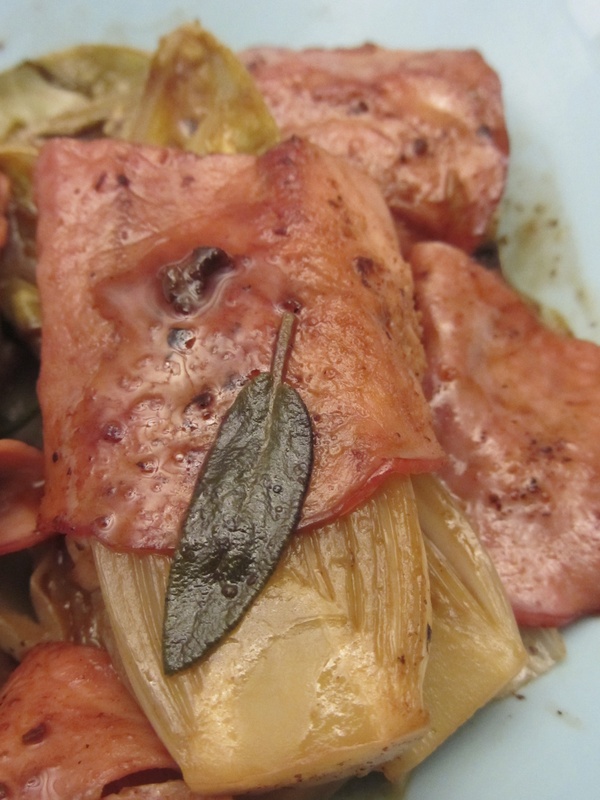 I’ve developed a version of the renowned Cook’s Illustrated recipe for braised endive, a recipe I’ve used religiously for many years, that incorporates a bit of the Dutch preparation with ham. I found that regular boiled ham tends to get too leathery when you brown it off and tends not to “stick” to the endive when browning (see the image below — too much ham! ), so I switched over to a standard-quality prosciutto. Don’t bother with your finest Italian stuff here. It’s meant to be an accent, not a pig party. The result is an exquisite, buttery, slightly bitter, slightly smoky braise that’s so delicious you will not be able to stop eating them. I’m writing the recipe to serve two, even though, technically, it will serve four people with restraint. Because, yeah, whatever. Chicories. Give them a chance. You won’t regret it. 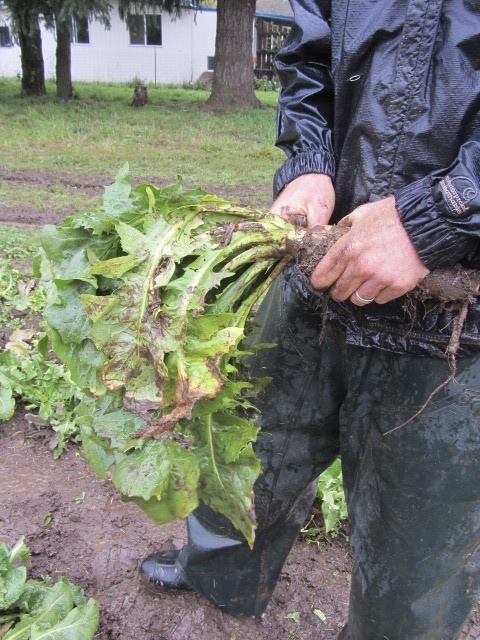 Remove any damaged leaves and cut endive in half, lengthwise. 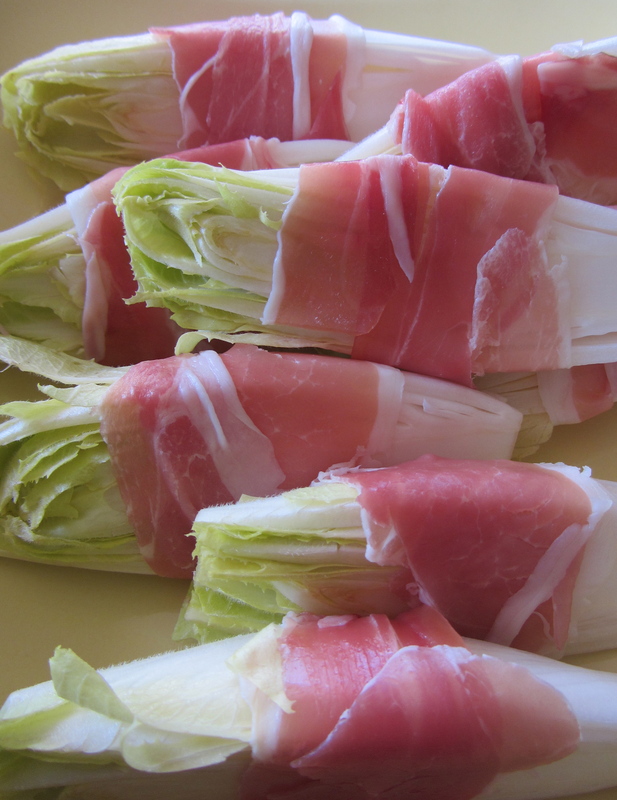 Wrap halves in prosciutto tightly. Melt 2 tablespoons of the butter on medium heat in a chef’s skillet large enough to hold all the heads in one layer (and make sure you have a cover large enough, too). You’ll use the rest of the butter for the sauce. When the foam reduces, add salt and sugar to promote browning. Place the heads in the skillet, cut side down. Cook until golden brown (about 5 minutes), then flip over and cook for another 5 minutes. Mix together the chicken stock, lemon juice, and thyme or savory, and pour into the skillet. Cover and cook until soft and succulent, about 15 minutes. Plate the endive, cut side up. On high heat, boil down the remaining juices with the tablespoon of butter reserved earlier until it forms a dark syrup, stirring frequently. Be careful to watch it, as it’s easy to burn the sauce at this point. 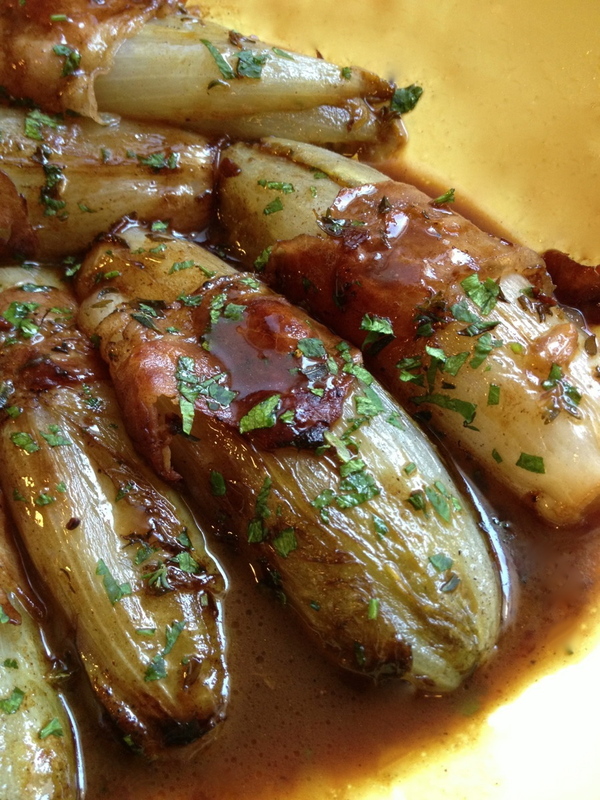 Pour the sauce over the endive, sprinkle with parsley, and serve. Serves 2 as a main dish with quinoa or bread, or 4 with restraint. It reheats nicely, but again, you won’t have any left. 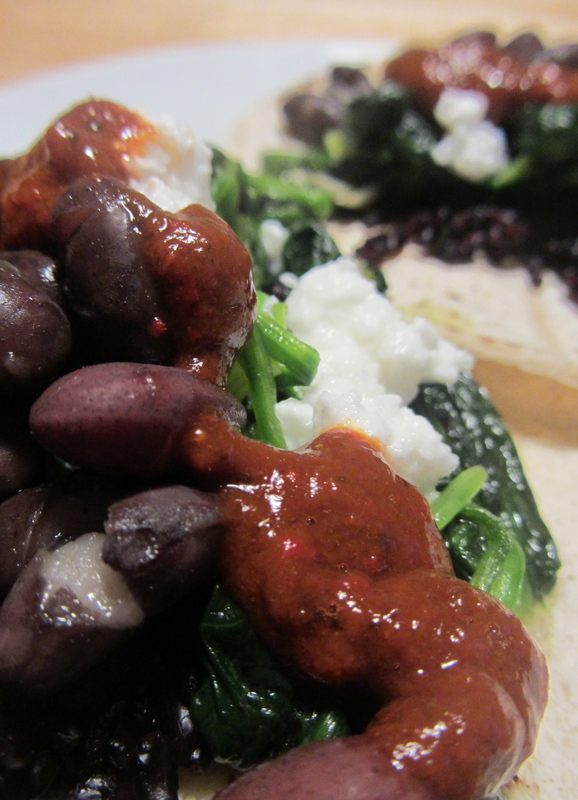 We eat bean-and-greens tacos about once a week at home, but because I always have fermented hot sauce or summer salsa hanging around in the refrigerator, I haven’t experimented much with all the peppers I dried last year. When I saw an experimental recipe for dried pepper ferments in the fabulous preservation blog Well Preserved, I remembered that I (1) grew a bunch of Central American chiles this year instead of the Hungarian ones I’ve been growing for years; and (2) dried a bunch of ripe pasillas (which grow very well here, by the way) and other peppers that were languishing in my cupboard. So red chile sauce it was. 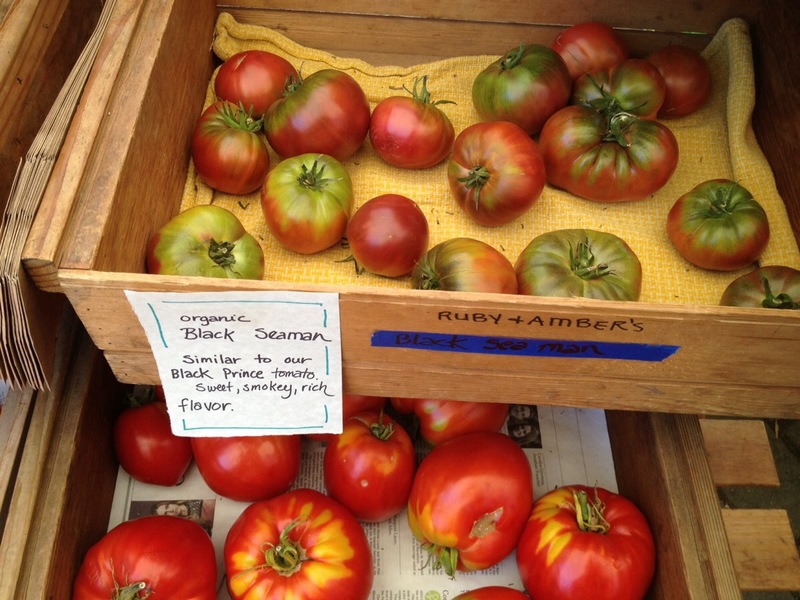 Relying on a Diana Kennedy classic recipe, I knew I couldn’t buy fresh tomatoes at this point in the dead of winter, so I used up my last jar of canned tomato sauce, the frozen tomato sauce having been long depleted. Because I wouldn’t be able to char the sauce as I’d char the skin of fresh tomatoes for more flavor, I decided to throw in a pretty little ice-cubed block of tomato paste that I managed to put up last fall. It turns out the tomato paste is crucial for body in the salsa, so don’t omit, even if you’re using fresh tomatoes. If you’re purchasing your tomato products, you might want to buy a can of tomato puree instead of diced tomatoes, because it’s thicker and sweeter. I was less interested in authentic flavors than in just getting rid of my chiles, so an Ethiopian brown, scorchingly hot beriberi pepper and I’m sure a Hungarian pepper or two snuck in there. You will probably be more discriminating. Also, note that you won’t be able to get the silky smooth texture without a blender, so don’t even try it. A good local bean for the tacos? Brighstone, a hearty pinto-like bean, which is a new discovery by Adaptive Seeds/Open Oak Farm this year. 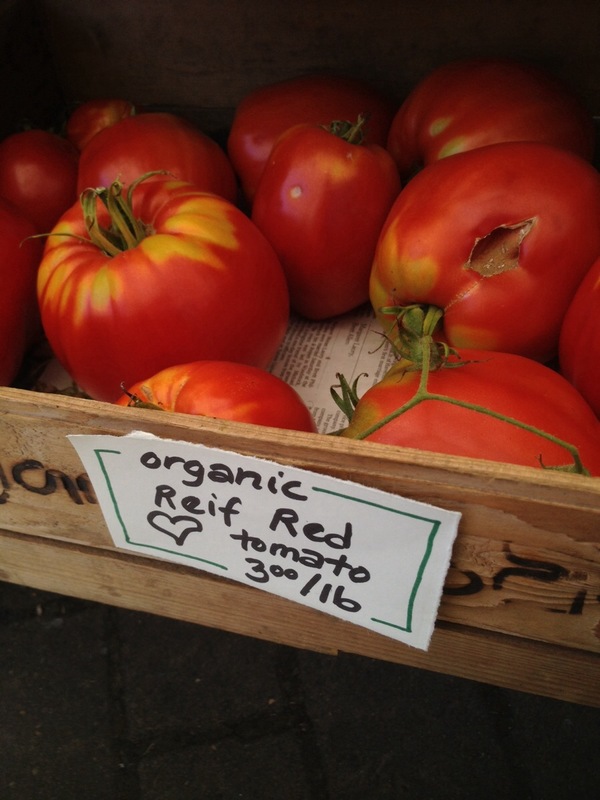 And if you’re interested in farming, Central America, or how things grow in places involving the word Willamette, you’ll most definitely want to check out our radio show, Food for Thought on KLCC Sunday at noon (PST) on 89.7FM in Eugene, or its sister stations in Oregon, or live on the web. Boris and I are trying something new, an interview with farmer/musician Joshua James, who is performing songs from his new album, From the Top of Willamette Mountain, at Sam Bonds tonight. We’ll also be joined by someone we’ve wanted to have on the show for a long time: Sarah Cantril, Executive Director of Huerto de la Familia, an agriculture and micro-business educational non-profit that teaches community integration, economic self-sufficiency, and organic farming skills to Latino families in Lane County. Listen in or be square! Toast peppers and sliced garlic, being careful not to let the peppers burn. Preheat a cast iron skillet over medium heat, then add the dried peppers and garlic, pressing them down and turning them over every few seconds until the peppers can be crumbled and you can smell the toasted smell. Remove from heat. Let peppers and garlic cool until easy to handle. 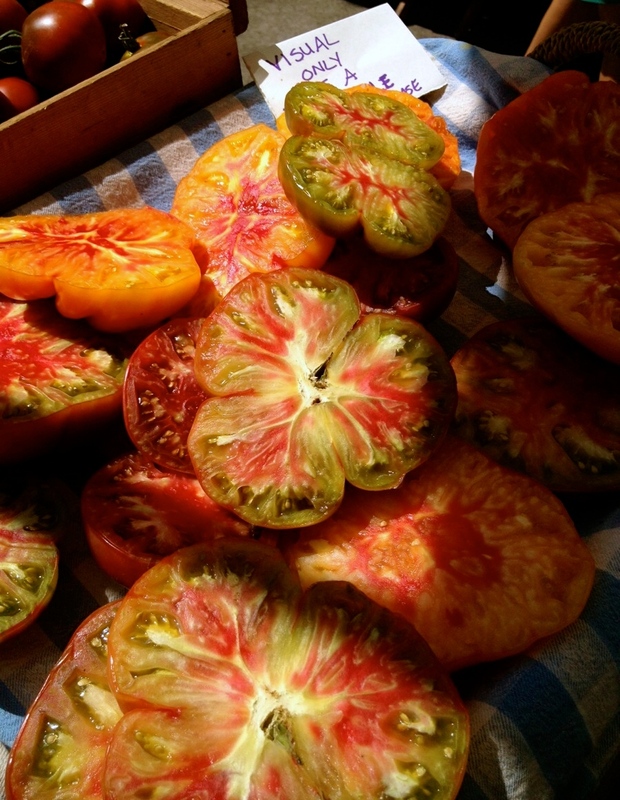 If you are using fresh tomatoes, char the skins over a gas burner or on the same hot cast-iron skillet, then peel off most of the blackened parts, before dicing. 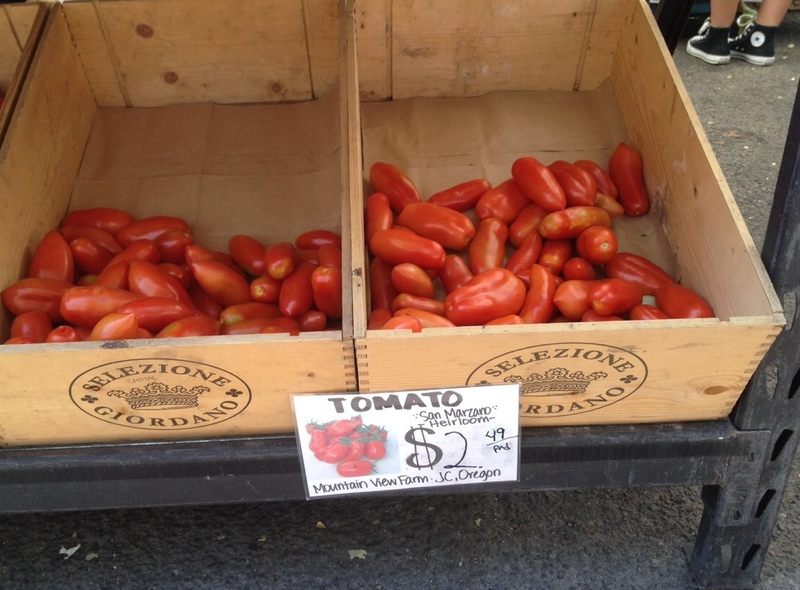 Place tomatoes, tomato paste, and optional water in a blender. Add garlic. Remove stems and seeds from chiles, then crumble pepper shells into blender. Blend for a few minutes on high, until the sauce is very integrated and smooth. Add salt to taste. 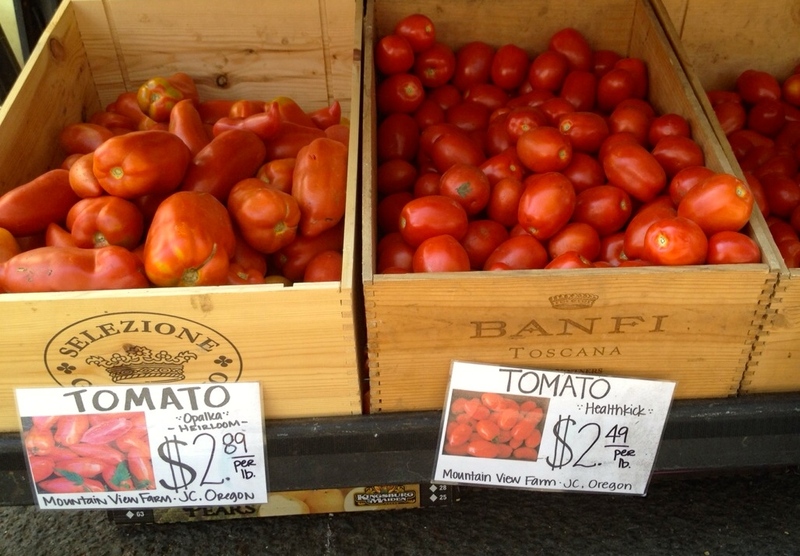 Refrigerate and use within a few days on anything that could use a nice kick of red sauce. If you’re anything like me, you’re out on the sodden streets of Eugene today, scrambling to buy some last minute gifts. Here’s stuff that appealed to this cook. May it appeal to the cooks in your life, too! A beautiful, high-quality, sturdy, imported Swiss fondue set. Even better, buy one yourself and have friends over for a fondue party. 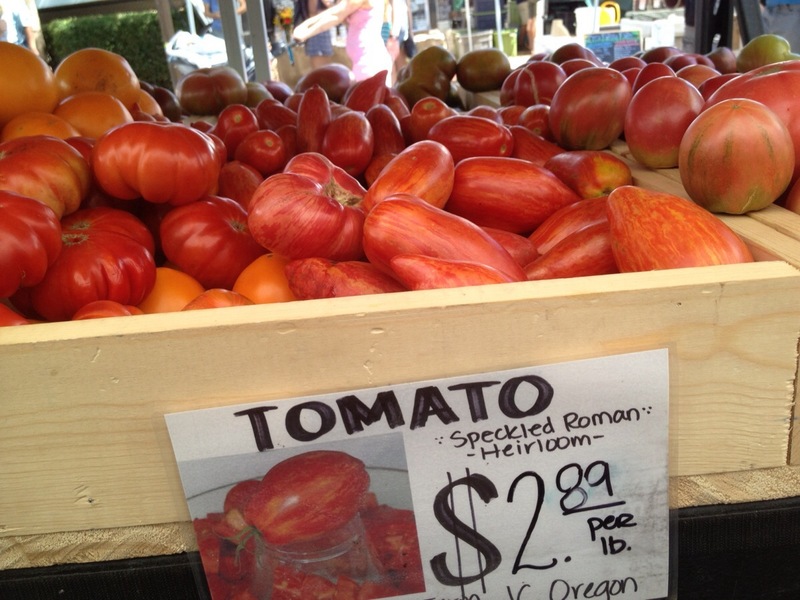 Good recent cookbooks from the PNW, plus Hank Shaw’s (who gets a geographic pass), curated by Kathleen Bauer. Naomi Duguid’s new Burma cookbook (available locally at Provisions). I have a number of Thai cookbooks, and none is perfect. So I’m ready to move to Burma, whose food is close to Thai but has more Indian influences. I noticed that interpretations of many of my favorite Thai recipes are in this book, and the pictures are gorgeous. Even better: we’re hosting Duguid on our next show on KLCC’s Food for Thought! A set of teenage-oriented cookbooks from British celebrity wunderkind chef Sam Stern. They seem less fussy than Rozanne Gold’s teen cookbooks, and much less insulting than the “OMG I am a cooking idiot! !” style book of basics. I don’t love the whole celebrity chef thing, but he seems to have a good sense of what teens might like to cook and eat, so I bought one for my seventh-grade nephew for Christmas. We’ll test this idea out. Could crash and burn. What do I know? A set of soufflé dishes made from French porcelain in 1/1.5/2 quart sizes. Alas, I bought the Chinese stuff because I’m cheap. Since the Mason Shaker is sold out, consider this DIY bar shaker made from a canning lid and a drill. Redneck Manhattans. Then you wouldn’t feel bad about spending all that money on the soufflé dishes and the nut bowl. A little terrine mold, complete with a wood press. An All-Clad food mill. Between that and the terrine, I’ve become very interested in mashing all my food together lately. Not sure why. A meat grinder attachment for a KitchenAid mixer. See above. An Imperia pasta machine. You spend too much money on crackers and should be making them at home, to say nothing of pasta. This machine would do the trick. Put your mashed foods on a pedestal, literally. I saw these clever Serveitup pedestals that can attach to any dish with a suction cup while I was shopping at a local kitchen store today. A pH tester suggested by Punk Domestics alongside many other DIY gifts. It can give you a sense of which fruits and vegetables are low acid for canning (but do use a safe recipe). Imported yellow Nordic split peas (they have them at Newman’s Fish Market, where you should also pick up some smoked whitefish dip and wine-marinated herrings). And speaking of spice mixes, I was rather obsessed for a while with the Bengali spice mix called Panch Puran (a blend of fenugreek, cumin, black mustard seed, fennel seed, and onion seed); it’s terrific with fruit chutneys, cauliflower curry, and baked quince. A bottle of the herbal liqueur Bénédictine to make the classic drink B&B with equal parts brandy and Bénédictine. This wintry cocktail was introduced to me by my neighbor the other day, and I’m sold. Aaaaand, Michael Ruhlman’s new offset tasting/basting spoons. Seems like a simple thing, doesn’t it, so why hasn’t anyone made them ’til now? Buy three bundled with some lovely wood “paddles” and a slotted offset serving spoon. A RELATED NOTE: do not buy the following — a hunk of pink salt; a panini press; pretzels topped with white frosting and pink and green squiggles; this banana slicer (read the reviews); Christmas ceramic anything; mulling spices; pocket-sized one-ingredient cookbooks; plaques that make pronouncements about the cook’s mood or sexual availability or types of food being served here (with or without prices). If you can’t think of anything, just go to a wine shop and ask them for a nice bottle of wine. Maybe something to go with fondue? PLUS EXTRA POINTS for anyone who can tell me more about the white sticks on a string used as Christmas decorations in Amsterdam, above. Anyone?